Are these drinks meant to please Instagram more than your palate? Three Dots and a Dash in Chicago has the over-the-top tiki-aesthetic down pat. 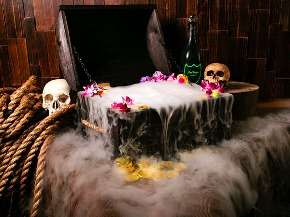 This boozy pirate's booty is served in a treasure chest and consists of a blend of Guatemalan rum and tropical juices, presented with a tableside bottle of Dom Perignon. Dry ice lining the chest allows it to spew a rather creepy Pirates-of-the-Carribean fog for you to enjoy with 6-8 friends. Cost: a trifling $385. How does it taste, you ask? Does anyone care? Of course not. You're drinking rum out of a treasure chest! Captain Jack Sparrow would be proud. With a name like The White Cosmopolitan, you'd expect a drink as generic as they come. But not at Daniel in New York City. This $22 variation of the classic Cosmo is made with vodka, white cranberry juice, St. Germain, and an ice sphere containing a single frozen orchid. Is the flashy flora contributing to the flavor in any way? I doubt it, but it's certainly pretty. Artesian's surrealist menu is truly, well, surreal. Situated in London and inspired by the works of Salvador Dali, every item reimagines the idea of the cocktail so abstractly that I'm not even sure how you consume some of them. Fast Money Comes at a Dangerous Price is no exception, presented in a gold bento box filled with black pebbles and—Parmesan crisps? The blend of Johnnie Walker Gold, chamomile, vetiver, sandalwood and kombucha sounds intriguing, but I hope this drink comes with directions. This is also the only beverage on this list that is listed on the menu with its own hashtag, so there's that. (It's #FeelSurprised if you were wondering). ZZ's Clam Bar in New York City loves to get weird with their offerings as evidenced by the fact that their chief bartender, Thomas Waugh (originally from Death and Co., hello! ), likes conceptualizing his drinks starting with the vessel first. The Coconut is, of course, served in a coconut. But it's not just served in a coconut; it's served in a coconut atop a bed of banana leaves nestled in ice and with a smoldering stick of Sri Lankan cinnamon. What's in it? Trinidadian rum, coconut cream, and acacia honey. But does it matter when the bartender making is it donning a white tux and gold booty shorts? Didn't think so. So, are these ridiculous drinks worth the price and the effort? Are they gimmicks, or are these methods truly resulting in incredible, memorable cocktails? It certainly seems to be working for some bars. Perhaps less is no longer more and simplicity is no longer king? Read more from Across the Bar.